The parishioners of Holy Trinity Orthodox Church in Randolph NJ were honored on 6-7 August 2016 to have Archbishop Michael visit them. The purpose of his visit was to bless the church’s refurbished stained glass windows. Thanks to the generosity of many parishioners, the windows which were damaged due to time and weather had been removed, repaired, and reinstalled. Parishioners received an explanatory booklet about Holy Trinity’s windows, most of which depict a Christian symbol or cross. 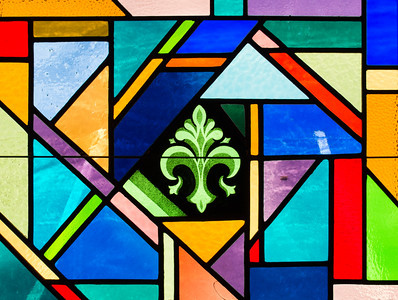 One frequently used symbol is the fleur de lis, a representation of the Holy Trinity. His Eminence arrived for Great Vespers on Saturday, the Feast of Holy Transfiguration. The next morning he celebrated the Hierarchical Divine Liturgy with: Reverend David Fox (parish Rector); Very Reverend George Hasenecz (retired, former parish Rector); and Very Reverend Samuel Kedala (retired, former Dean and Rector of Holy Spirit Church in Wantage NJ). 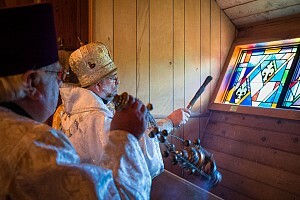 At the end of the Liturgy Archbishop Michael blessed each of the refurbished windows. His Eminence presented Dr. Elizabeth Theokritoff with a Gramota (certificate of appreciation) for her many contributions to Holy Trinity parish and the Orthodox Church in America as a whole; he also presented her a posthumous Gramota for her late husband, +George Theokritoff, citing his lifetime of work in the church and his contributions in the relationship between faith and science. Father Samuel and Matushka Joanne Kedala were honored with a Gramota in recognition of their fortieth wedding anniversary. “A wonderful luncheon was served and the fellowship was enjoyed by all,” said Suzette Eremin (parish administrative assistant).